Cards on the table first. 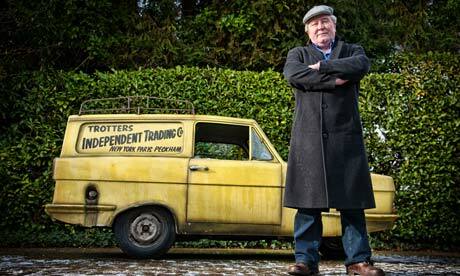 Only Fools and Horses – classic comedy. Up there with the very best of British. I’ll add Dad’s Army in that bracket too. That wondrous combination of superb character acting and top-notch writing. Hats off to the late John Sullivan and Jimmy Perry for that (the latter still thankfully with us, aged 90 now). That’s not to say that formula is enough in itself, of course, but sometimes the chemistry really works. 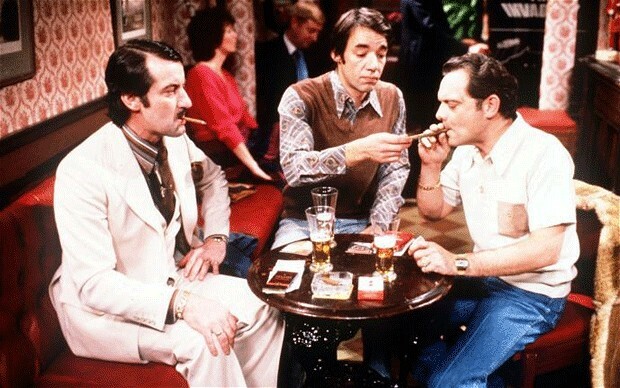 I’ve dwelled on Dad’s Army on this blog before, and now I’ve got a great excuse to enthuse a little about ‘the nation’s favourite sitcom’, Only Fools and Horses – having caught up with John Challis barely six weeks after the passing of his great friend and on-camera colleague Roger Lloyd-Pack, Trigger to John’s Boycie. There’s the thing, Roger’s death in mid-January at the age of 69 knocked us all for six, let alone a bloke who’d known him well for more than 30 years. It was a similar tale with John Sullivan, who died aged just 64 just under four years ago, another brave man who kept his deteriorating health to himself, not just to the public but close friends and colleagues too. Times like that clearly knock your faith, but John, 71, has dusted himself down and got back on the road again with his one-man show, talking about Being Boycie and so much more. And here’s what he had to tell me. 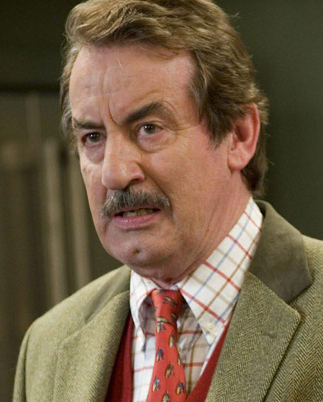 What strikes you first on speaking to John Challis is that accent. 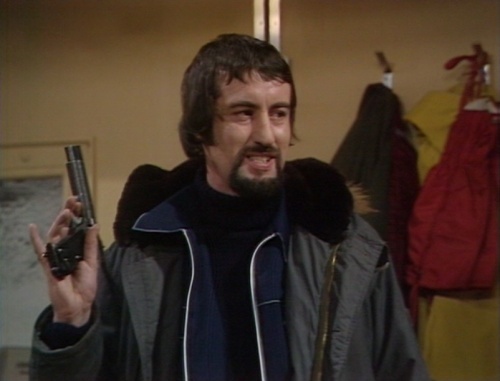 Here’s an actor born in Bristol and brought up in South-East London, but … well, he’s no Boycie. It makes sense of course, and while the role John will be forever associated with is that of a certain Terrance Aubrey Boyce that shot to fame in Only Fools and Horses, in real life they haven’t a lot in common. If anything, John’s telephone voice is more refined Home Counties, as you might expect from the son of a civil servant who attended a boarding school outside Woking and started out as an estate agent in Ashstead and Leatherhead. But that was never likely to be the full story for John, and soon acting paved the way forward for this amiable septuagenarian, currently doing the rounds promoting his books. And the number of sell-outs en route suggests a continued love for ‘Boycie’ out there. “It’s amazing so many people want it, but I think word got around as I did quite a few shows last year. I’ve got together a nice package of silly stories and general showing off. (John adopts plummy theatrical tones) “You know us actors! “It’s great, otherwise I wouldn’t do it. I’ve always loved a live audience, which you don’t necessarily get on the telly. Having grown up in the theatre, it’s what I enjoy and just seemed the most natural thing to do. “As long as you’ve got some words to say. Usually they’re other people’s words, but the trouble with this is that it’s me and my words! But I seem to have got it right. It’s not just the quality of acting, but the quality of writing too. I take it you’re extremely proud to have been part of the UK’s most popular sitcom of all time? I bet you’ve cringed at the sound of someone shouting ‘Boycie’ at you over the years though. It’s been such a huge period of your life – 20-plus years, then Boycie’s four-series The Green, Green Grass spin-off, also penned by John Sullivan. “Extraordinary. I thought it was the end of it all, then John came to a birthday party I had when I had moved out of London to the Shropshire/Herefordshire border, and saw me completely out of context. He wondered what would have happened to my character if he’d done the same, and wondered why he’d have wanted to leave London. It took him about two years to find a reason. Was it nice to do a show on your own patch? I let on to John that I have a cousin in Canada called Marlene, and how it’s taken me a long time to say her name without reverting into a Boycie voice. I get the same reaction from everyone when I mention her name, and hold him responsible. 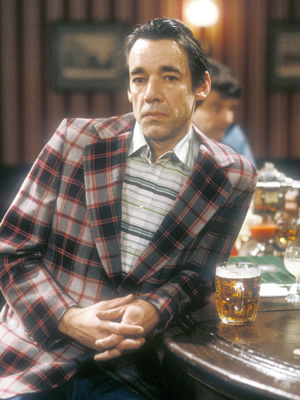 On a sadder note, you were very close to Roger Lloyd-Pack. Did his recent death hit you hard? “A terrible shock. I knew he wasn’t well, as he hadn’t shown up at a couple of conventions and signings, and I phoned him just two days before. He wasn’t feeling great. He said he’d phone back and did, but it wasn’t the right time, so he said he’d phone back the next day. But he never did. I left a message, and the next day he’d gone. “It just knocked me sideways. I had no idea about the extent of it. Quite rightly he kept it very secret. He didn’t want people to know, didn’t want the fuss and having to field calls every five minutes if it had got in the press. That would have been quite difficult for him and the family. I believe you’re an Arsenal fan, and he was Spurs. Does that prove we can all get on if we try? The death of John Sullivan must have been a very sad loss too. “A terrible loss to the nation. Again, it was a shock. He’d been very ill with viral pneumonia but was out of intensive care and looking forward to getting back in the swing of things, laughing and joking. When I got the call from our producers saying he’d passed away I couldn’t believe it, and still can’t get my head around John or Roger going. They were both such a part of my life, for over 30 years. What did you make of Stephen Lloyd as the younger you in the Rock & Chips prequel? 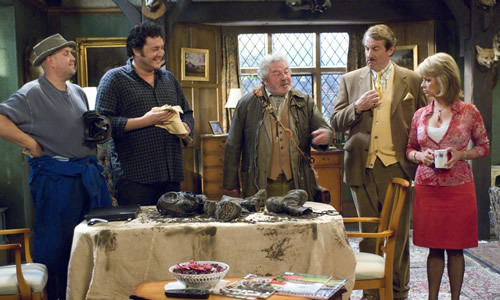 Was there any advice for him from the older, wiser Boycie? Did you base Boycie on anyone in particular? “Yes, a regular in this South-West London pub, the St Margaret’s Hotel in East Twickenham. He fascinated me, with such a self-inflated idea of his importance. He got sent up something rotten. But it all bounced off him – he had the thickest skin of anyone I’ve ever met. A real Walter Mitty, with (adopts Boycie’s voice again) this curious, pedantic way of talking. I always remembered it. Looking at your earlier career, you did play a lot of coppers or loveable rogues, and sometimes characters somewhere in between, from Z Cars and The Sweeney through to Juliet Bravo and Heartbeat, and even a charming fake jewel thief in Last of the Summer Wine. 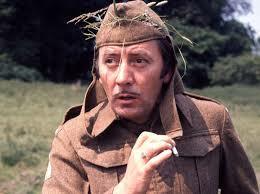 Getting back to my earlier Dad’s Army comparison, I suppose there was a bit of James Beck (the ultimate spiv, Private Joe Walker) in there. Would you ever have been happy as an estate agent? “No. I was hopeless. Everyone put me off being an actor because it was so insecure. I became articled to an estate agency in Ashstead and then Leatherhead, because I thought that was what I had to do. But I just couldn’t bear it. Eventually they sacked me, quite rightly. Your CV as an actor is mightily impressive, and substantial. You were in Dr Who in Tom Baker’s time. 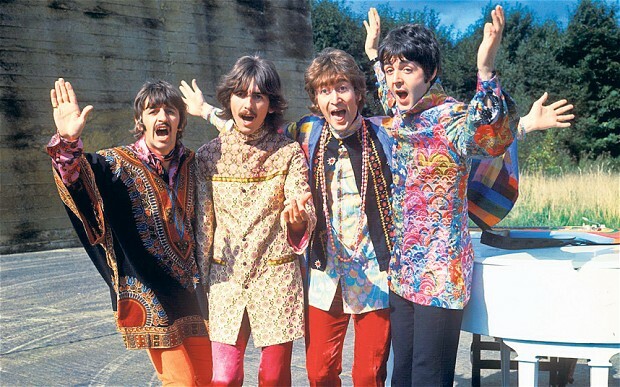 And you came close to being on The Beatles’ Magical Mystery Tour bus in 1967 too. “I should have been. It was one of the biggest disappointments of my life. I met John, Paul and Ringo, who were looking for someone to be on the coach tour. The world and his wife were going up for it, but for some reason we hit it off, despite the fact I said I preferred the Rolling Stones! I was very cheeky in those days. I understand you also sunk the odd drink with footballing legend George Best and hell-raising actor Oliver Reed too. “The first film I ever did was with Oliver. Well, he was the star of the show and I was playing a relatively minor part. I remember the first night in the hotel on location. Traditionally, you’d have quite a lot to drink, to wet the film’s head. On this occasion there was a Chinese king fu artist involved, and quite late that night Oliver decided he wasn’t a king fu artist at all, but an imposter. This guy, quite famous at the time, proved himself by chopping a table in half with his hand. Oliver said, ‘Anyone can do that!’ and he had a go. Well, it just descended into chaos, with the hotel looking very sorry for itself. He was a notoriously eccentric character and always looked as if he knew something you didn’t! He was always laughing and not taking anything too seriously. You’re 71 now. Do you feel it? “Touch wood, I’ve still got most of my health. It just gets a bit creakier, and you haven’t quite got the energy you used to. I’ve got quite a big garden I try to look after, and find it increasingly difficult to get around it all when the Spring comes. And you’ve got no children to do that garden for you? With no disrespect to your previous three wives, have you saved the best times until last? 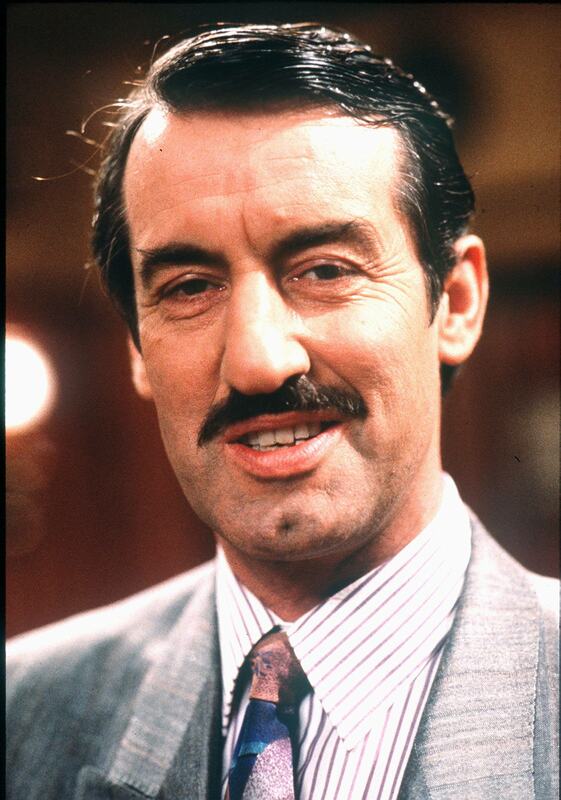 And has Carol (with whom he has been together for around 25 years now) got a better John Challis for all that experience? “I’m a very lucky man really. I met Carol in 1990 and we’ve been together ever since, having been around the block a few times and through quite a lot. To find out about tickets for John’s tour and how to get a book dedication if you can’t get to one of his shows, head to his publishing company’s webpages via http://www.wigmorebooks.com/events.php. 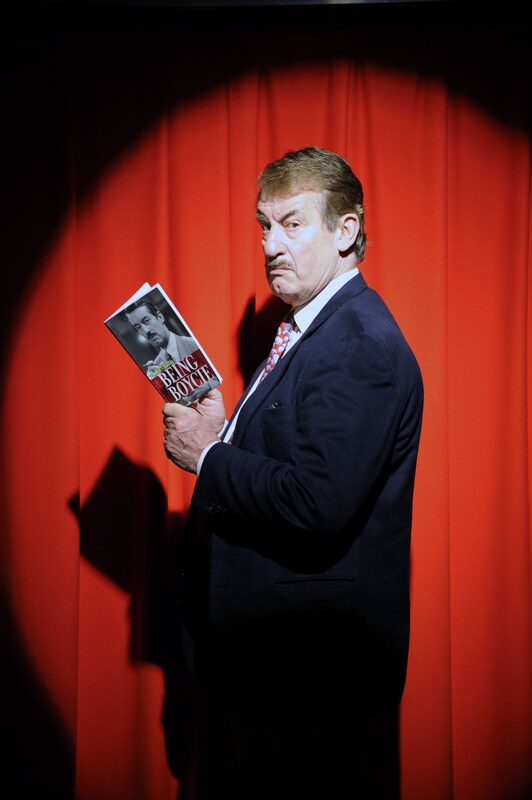 The same links will take you to details about John’s two autobiographical books, Being Boycie and Boycie & Beyond. This is a revised, enlarged edition of a Malcolm Wyatt feature for the Lancashire Evening Post. This entry was posted in Books Films, TV & Radio, Comedy & Theatre and tagged Boycie, Dad's Army, Dr Who, James Beck, John Challis, John Sullivan, Oliver Reed, Only Fools and Horses, Roger Lloyd Pack, Sir Donald Wolfit, Sue Holderness, The Beatles. Bookmark the permalink. 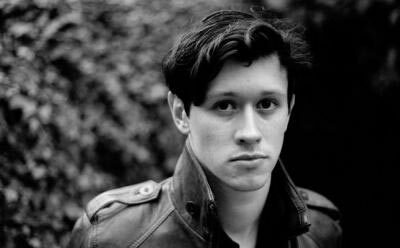 Do head over to this blog for some fascinating TV and music related interviews and reviews. Good recent one with the Spin Doctors too.